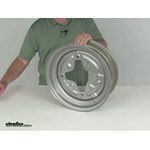 Get that vintage look for your trailer with this silver star-pattern trailer wheel. The 15" steel wheel features a 4 on 9.44 bolt pattern and meets Department of Transportation standards. Lowest Prices for the best tires and wheels from Dexstar. Dexstar Vintage Steel Wheel w/ +5 mm Offset - 15" x 5" Rim - 4 on 9.44 - Silver part number AM20395 can be ordered online at etrailer.com or call 800-298-8924 for expert service. 20395DX Dexstar Vintage 494 Steel Wheel - 15"
Bias tire has a ply rating of 6 and a 1,360-lb maximum load at 50 psi. The 13" diameter x 4-1/2" wide steel trailer wheel features a 4 on 4 bolt pattern and a corrosion-resistant galvanized finish. Trailer Hub Wheel Stud, Screw-In, 1/2" x 2"
Today I'm going to review part # AM20395, this is the Dexstar Vintage 15 inch x 5 inch Steel Trailer Wheel with the 4 on 9.44 bolt pattern and a 1/2 inch positive offset in silver and color. This wheel is a sturdy steel construction. They use a nice silver pwoder coat finish over an e coat primer on the front and back of the wheel. This gives you excellent corrosion resistance. This is a vintage design; has the star pattern to it. It does have the 1/2 inch positive offset to ensure that he wheels position closer to the trailer frame basically on the offset most trailer wheels, this mounting surface that goes up against the hub on your trailer is usually positioned right at the center line of the wheel. On some wheels they do give an offset to have them clear brakes or something from underneath the trailer. In this one they moved this mounting surface a 1/2 an inch positive, which means to the outside, which in turn will pull the tire and wheel closer to the trailer frame. This is a high quality wheel; does meet the Department of Transportation specifications. It is made in the USA. A few specs on this. The dimension is 15 inches in diameter and 5 inches wide. When you do measure that you want to make sure your measuring inside the inside where the tire beads would seat. The same on the width, inside to inside because what your measuring on the dimensions is when the tire is seated on here the beads seat right here so that's what should be measures. The diameter is going to measure inside to inside. Let's put a ruler on that. If you go inside to inside you'll see 15 inches for the diameter. The width again inside to inside. You'll see 5 inches. Now the bolt pattern; this is a vintage bolt pattern. It's a very large bolt pattern. You can see the four holes. On a wheel that has an even number of holes, in this case four, you just measure from the center of one hole directly across to the center of the hole right across from it. On this one, if we put a ruler on it, you will see it gives you the 9.44 bolt pattern. This does use a wheel lug size of a 1/2 inch x 20. The load range is 1,680 lb. Again, just to mention it does use a 1/2 inch positive offset which moves this mounting surface 1/2 inch to the outside of the wheel which in turn makes the wheel move closer to the trailer frame. 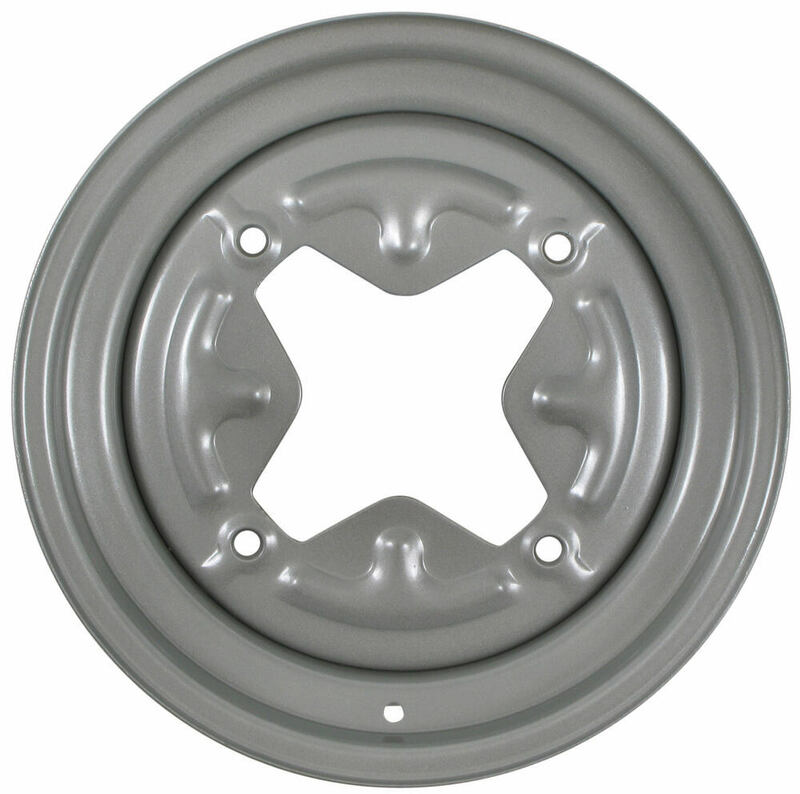 That should do it for review part # AM20395, the Dexstar Vintage 15 inch x 5 inch Steel Trailer Wheel with the 4 on 9.44 bolt pattern, 1/2 inch positive offset in silver and color.	.
Order: RelevanceNewestRating - High to LowRating - Low to High Get that vintage look for your trailer with this silver star-pattern trailer wheel. The 15" steel wheel features a 4 on 9.44 bolt pattern and meets Department of Transportation standards. I have a 1977 Prowler 20 double axle trailer. what would be the proper wheel and tire for a spare? To determine that, we need to what tires and wheels are currently on the trailer. The tire size will be on the sidewall of the tire and that will provide most of the information. The only other bit we would need, would be the GVWR, Gross Vehicle Weight Rating, and the bolt pattern of the wheel. GVWR will be on the plate or engraving that indicates the other trailer capacities, usually it is on the frame close to the coupler. Bolt pattern will require some measuring, but I have linked to an article that will walk you through that procedure. It sounds like you are looking for a vintage style trailer wheel that has the 4 on 9.44 inch bolt pattern. I attached a link to a page that has all of these style wheels we offer, but if you are looking for a 15 inch version you would want part # AM20395. I attached a review video for this wheel for you to check out as well. We offer a 7.00-15LT tire as part # AM10414. I believe the rim you're looking for is what's referred to as a 'Vintage Steel Wheel', like part # AM20501 for a 6 inch wide rim or # AM20395 for a 5 inch wide rim. The wheel has a 4 on 9.44 inch wheel bolt pattern, as shown in the provided photo. Yes, the Dexstar Vintage Steel Wheel # AM20395 should work well for you. This is a 15 inch rim with a 4 on 9.44 inch bolt pattern like what you have. We have two 1/2 inch coarse threaded wheel bolts. The part # 7-23 that is 2-1/4 inches in length and the part # 090753 that is 1-5/8 inches. Good news either wheel will work for you. If you are trying to just replace one wheel you would want to check to see what size you have on the other side of your trailer and match them up, but if you are replacing both then you can choose either the # AM20501 or the # AM20395. Both will accommodate your tire size of ST205-75D15. I have linked our Help Article on Tire Sizing for your convenience. We do have a couple of steel wheels with the 4 on 9.44 bolt pattern in a 15 inch. 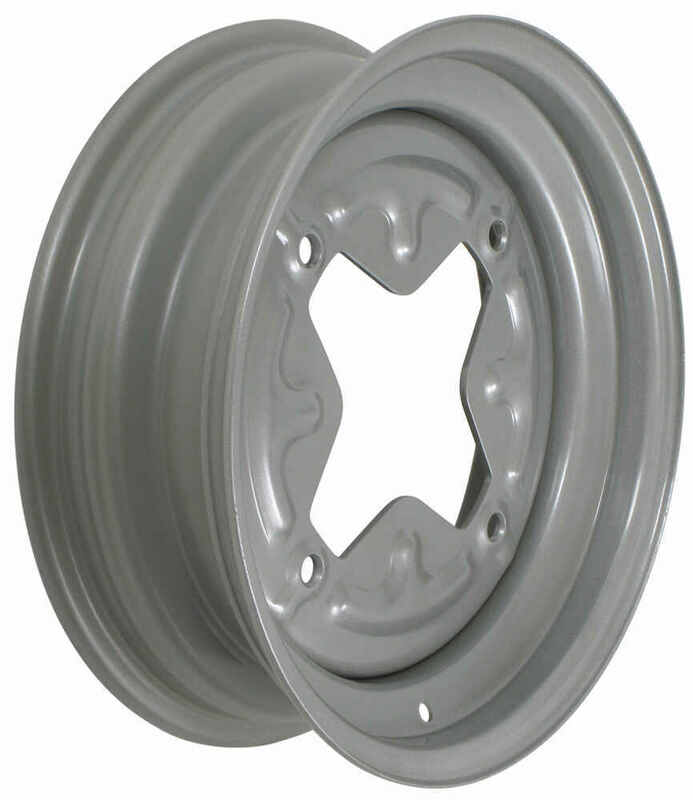 We have wheel # AM20501 which is a 15 x 6 inch wheel rated for 2,330 pounds. And we have # AM20395 which is a 15 x 5 inch rated for 1,680 pounds. Both wheels have a 1/2 inch positive offset (the tire will be 1/2 inch closer to frame than wheel with zero offset). The 7.00-15 tire size will fit either size wheel.